I-joists consist of flanges typically made from solid timber, LVL (Laminated Veneer Lumber) or LSL (Laminated Strand Lumber) and a web made from OSB (Oriented Strand Board), particleboard or plywood. I-joists are some of the most commonly used Engineered Wood Products (EWP) in both residential and commercial buildings for floor and roof assemblies. The flanges and web are bonded together to form an efficient I cross-section that can save up to 50% of the wood material compared to a solid timber member [1R.J. Leichti, R.H. Falk, and T. Laufenberg, "Prefabricated Wood Composite I-Beams: A Literature Review", Wood Fiber Sci., vol. 22, no. 1, pp. 62-79.-3A.B. Jahromi, B. Zhang, A. Harte, B. Walford, K. Bayne, and J. Turner, "Investigating the structural performance of multi-webs I-Beams", J. Inst. Wood Sci., vol. 17, no. 3, pp. 148-158. [http://dx.doi.org/10.1179/wsc.2006.17.3.148] ]. Concentrating material away from the neutral axis in this way enhances the flexural and load carrying capacity of I-joists and can be more efficient compared to solid timber joists. They are also light-weight, easier to handle on site and have a high strength-to-weight ratio, which has contributed to their large scale use the construction industry. Issues can arise when openings in the web are required to accommodate services within floor or roof assemblies. These web openings reduce the shear capacity and structural integrity of the joist. 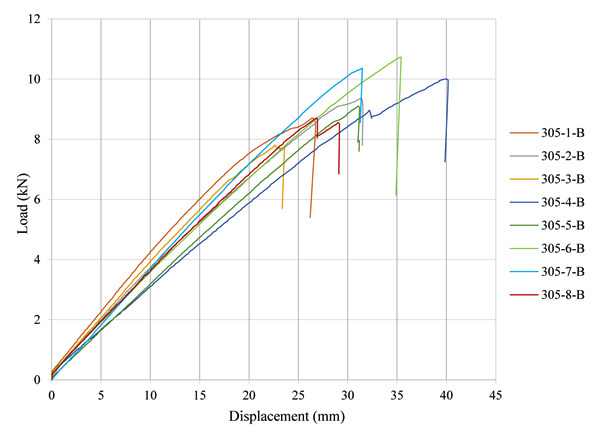 The impact of circular and square web openings on the structural performance of timber joists has been examined in a number of studies and many failure modes have been observed: excessive stresses around openings [1R.J. 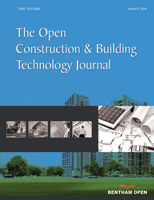 Leichti, R.H. Falk, and T. Laufenberg, "Prefabricated Wood Composite I-Beams: A Literature Review", Wood Fiber Sci., vol. 22, no. 1, pp. 62-79.-5G.B. Pirzada, Y.H. Chui, and S. Lai, "Predicting Strength of Wood I-Joist with a Circular Web Hole", J. Struct. Eng., vol. 134, no. 7, pp. 1229-1234. [http://dx.doi.org/10.1061/(ASCE)0733-9445(2008)134:7(1229)] ], web pull-out from the flange [6G.C. Morrissey, D.W. Dinehart, and W.G. Dunn, "Wood I-Joists with Excessive Web Openings: An Experimental and Analytical Investigation", J. Struct. Eng., vol. 135, no. 6, pp. 655-665. [http://dx.doi.org/10.1061/(ASCE)ST.1943-541X.0000013] , 7A.M. Harte, and G. Baylor, "Structural evaluation of castellated timber I-joists", Eng. Struct., vol. 33, no. 12, pp. 3748-3754. [http://dx.doi.org/10.1016/j.engstruct.2011.08.011] ], web buckling [7A.M. Harte, and G. Baylor, "Structural evaluation of castellated timber I-joists", Eng. Struct., vol. 33, no. 12, pp. 3748-3754. [http://dx.doi.org/10.1016/j.engstruct.2011.08.011] , 8M. Ardalany, M. Fragiacomo, D. Carradine, and P. Moss, "Experimental behavior of Laminated Veneer Lumber (LVL) joists with holes and different methods of reinforcement", Eng. Struct., vol. 56, pp. 2154-2164. [http://dx.doi.org/10.1016/j.engstruct.2013.08.034] ], failure of the web post between two openings [7A.M. Harte, and G. Baylor, "Structural evaluation of castellated timber I-joists", Eng. Struct., vol. 33, no. 12, pp. 3748-3754. [http://dx.doi.org/10.1016/j.engstruct.2011.08.011] -10E.C. Zhu, Z.W. Guan, P.D. Rodd, and D.J. Pope, "Finite element modelling of OSB webbed timber I-beams with interactions between openings", Adv. Eng. Softw., vol. 36, no. 11–12, pp. 797-805. [http://dx.doi.org/10.1016/j.advengsoft.2005.03.027] ] etc. Afzal et al. [4M.T. Afzal, S. Lai, Y.H. Chui, and G. Pirzada, "Experimental evaluation of wood I-joists with web holes", For. Prod. J., vol. 56, no. 10, pp. 26-30.] investigated the effect of circular and square openings on the structural integrity of I-joists with OSB webs and also the influence of adjacent openings. They found that there was no interaction between adjacent openings with a minimum clear distance of two times the width of the hole but openings with lesser clear distances experienced reduced bending moment capacity. Morrissey et al., [6G.C. Morrissey, D.W. Dinehart, and W.G. Dunn, "Wood I-Joists with Excessive Web Openings: An Experimental and Analytical Investigation", J. Struct. Eng., vol. 135, no. 6, pp. 655-665. [http://dx.doi.org/10.1061/(ASCE)ST.1943-541X.0000013] ] also examined circular and square openings in I-joists but focused on the position of the opening along the length of the joist. They found that openings closer to high shear areas resulted in lower load carrying capacity for all joist depths studies regardless of the opening shape. 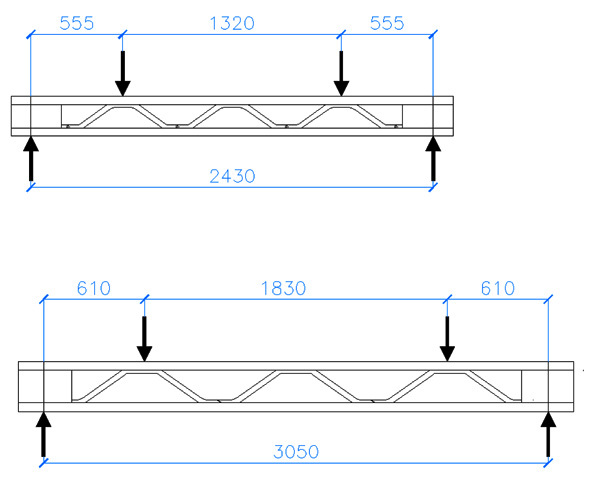 Nowadays, commercial joist manufacturers specify limits on the size of openings and position along the joist length for their joists to ensure the structural integrity of their product is not compromised [11"ETA-12/0480, LP Solid start LPI-Joists", EOTA-European Organisation of Technical Approvals, pp. 1-26. 2012-13"ETA-09/0283, Boise BCI Joist", EOTA-European Organisation of Technical Approvals, .]. There are also additional concerns during the installation of such structural elements on site. Capacity reducing modifications can occur to accommodate services during the construction phase or post-construction retrofitting. Islam et al., [14M.S. Islam, M. Shahnewaz, and M.S. Alam, "Structural capacity of timber I-joist with flange notch: Experimental evaluation", Constr. Build. Mater., vol. 79, pp. 290-300. 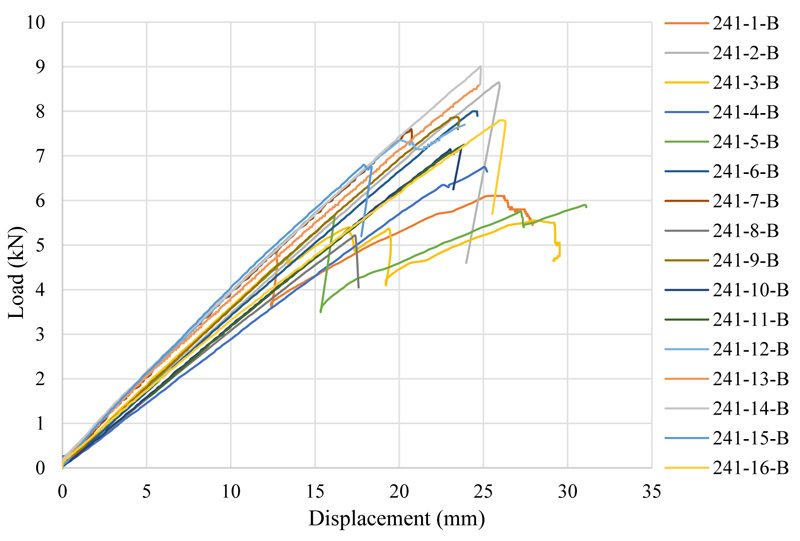 [http://dx.doi.org/10.1016/j.conbuildmat.2015.01.017] ] investigated the influence of a flange notch in structural I-joist elements. It was found that such notches greatly reduce the load carrying capacity of the joist with reductions in capacity of up to 80% reported compared to uncut I-Joists. Shahnewaz et al., [2M. Shahnewaz, M.S. Islam, M. Ahmadipour, T. Tannert, and M.S. Alam, "Reinforced Wood I-Joists with Web Openings", J. Struct. Eng., vol. 143, no. 6, p. 04017022. [http://dx.doi.org/10.1061/(ASCE)ST.1943-541X.0001747] ] demonstrated that openings in webs can be reinforced and while the presence of openings can reduce the capacity by 54%, the use of OSB collar reinforcement can increase the capacity of a wood I-joists with an opening by up to 27%. Such modifications, normally performed on-site, can be time consuming and costly to implement. As a result, there is a need for an open joist solution that does not require modifications on-site. For this reason, commercially available open web I-joists, manufactured using steel webs, which provide openings through the web to accommodate services and ducts, have become popular in construction in recent years [15B. Zhang, A. Kermani, and T. Fillingham, "Vibrational performance of timber floors constructed with metal web joists", Eng. Struct., vol. 56, pp. 1321-1334. [http://dx.doi.org/10.1016/j.engstruct.2013.07.011] -17"ETA-07/0032, EASI-JOIST, Open Web Beams", EOTA-European Organisation of Technical Approvals, .]. In this study, the moment and shear capacity of a latticed LVL-webbed I-Joist is investigated. The objective is to utilise engineered timber to create a sustainable all-timber joist product with reduced environmental impact. The use of latticed LVL in the web is a highly engineered solution to commonly used solid web timber I-joists with the added advantage of providing adequate space for services. The moment and shear capacity of the novel latticed LVL-webbed I-Joists are compared to that of commercially available timber I-joists. The novel I-Joist can be seen in Fig. (1) . As the use of latticed LVL webs in timber I-joists is a new concept, there have been no studies published on their structural behaviour. This study examines the structural behaviour of latticed LVL web beams. I-joists of 241 mm and 305 mm depth are subjected to bending and shear tests to evaluate their structural properties. Two different adhesive types were used in the manufacture of the webs, namely, Urea Formaldehyde (UF) and Phenol Resorcinol Formaldehyde (PRF). The specimens are designated 241-1-B, 305-2-S etc. The first three digits denote the depth of the joist. The second digit denotes the specimen number and the final letter denotes the test configuration (B = bending test set-up, S = Shear test set-up). For manufacturing of the lattice components, 1.8 to 2.0 mm veneer sheets are bonded in a specially designed mould and subjected to heat and pressure using a radio frequency press. Radio frequency curing is especially suited to curved elements with uniform heating of the veneer sheets and rapid curing of the adhesive. Curing time of four minutes was required for the UF adhesive and 5 minutes was required for the PRF adhesive. The press pressure applied was approximately 1000 kN/m2 and was applied for the duration of the curing. Upon removal from the press, the cured LVL curved lamina is cut to width. The width of the LVL lattice components was 30 mm for both joist heights, but the thickness was 31.5 mm for the 241 mm deep joist and 36 mm for the 305 mm deep joist. Each end was then finger jointed, male and female, as seen in Fig. (2) . A total of 30 joists were manufactured. The 241 mm and 305 mm deep joists had flange sections of 60 x 50 mm2 and 65 x 55 mm2, respectively. Grade C24 Norway spruce timber was utilised for the flanges of the joists with the exception of two joists which utilised Irish-grown Sitka spruce timber. The cross-section of the 241 mm and 305 mm deep joists can be seen in Figs. (3) along with the manufactured joist. A groove was routed the entire length of the top and bottom flanges to house the LVL webs. Groove depths were 15 mm for the 241 mm deep joists and 17 mm for the 305 mm deep joists. The LVL webs were finger jointed prior to being adhered within the routed grooves. As previously mentioned, two different adhesive types were used to manufacture the LVL webs and to be consistent, the same adhesive was used to bond the flanges to the latticed LVL web. The joists were assembled, glued, clamped under pressure and allowed to cure. The ends of each joist contain a solid end block. The solid end blocks provide some flexibility for on-site trimming to a shorter span if desired, without compromising the structural integrity of the joist. All joists were conditioned at a relative humidity of 65% and a temperature of 20°C prior to experimental testing. Bending and shear tests were carried out for each joist depth. Joists subjected to bending tests were tested in four-point bending over a span of 18 times the joist depth and joists subjected to shear tests were tested in four-point bending over a span of 10 times the joist depth in accordance with the standard, EOTA TR002 [18EOTA, "Technical Report 002: Test methods for light composite wood-based beams and columns", European Organisation of Technical Approvals. 2000]. The bending and shear tests set-ups for the 241 mm and 305 mm deep joists can be seen in Figs. (4 and 5) , respectively. The locations of the load points were adjusted to coincide with the top arch of the LVL web in each case. Lateral restraints lined with frictionless Polytetrafluoroethylene (PTFE) plates were provided to avoid failure through torsional buckling of the member. The vertical deflection at the mid-span of each joist was measured using a Linear Variable Displacement Transformer (LVDT) positioned on the top face of the joist. After a preload, each joist was initially loaded to 40% of the maximum failure load (Fmax) to determine the modulus of elasticity. Each member was then loaded to failure at a rate 0.05 mm/s to ensure failure occurred within 600 ± 300s in accordance with EOTA Standard TR002 [18EOTA, "Technical Report 002: Test methods for light composite wood-based beams and columns", European Organisation of Technical Approvals. 2000] allowing the load-displacement behaviour and failure mode to be recorded. Characteristic values (5th percentile) have been calculated by examining the distribution of experimental test results in accordance with EN 14358 [19CEN, EN 14358. Timber Structures - Calculation of characteristic 5-percentile values and acceptance criteria for a sample., Comité Européen de Normalisation: Brussels, Belgium, .]. The characteristic value is calculated using Eq. (1) where is the mean value and is the standard deviation corrected by the factor, ks. The ks factor is an adjustment factor dependent upon the sample size. This factor provides an additional degree of safety when determining characteristic values by penalising smaller sample groups. Values for ks and the associated sample size are given in EN 14358 [19CEN, EN 14358. Timber Structures - Calculation of characteristic 5-percentile values and acceptance criteria for a sample., Comité Européen de Normalisation: Brussels, Belgium, .]. Latticed LVL web element with finger jointed detail. I-joist cross-section and component manufacture. Lattice LVL web joist geometry and bending test set-up. Lattice LVL web joist geometry and shear test set-up. The load-deflection response, maximum failure loads, and failure modes were recorded for all joists tested under four-point loading. The results for bending and shear tests on latticed LVL joists of depth 241 mm and 305 mm are presented. The load-deflection response for all 241 mm deep joists is presented in Fig. (6) . The majority of the joists displayed linear elastic behaviour until failure, however, three joists experienced residual capacity after an initial failure followed by an ultimate failure of the joist. The bending stiffness, first failure load, peak failure load, peak deflection, failure mode and the bending moment are presented in Table 1. As all joists failed either in the web or the web-flange interface, the shear force is also presented in Table 1. Three failure modes were observed during testing, namely, tension splitting of perpendicular to the grain in the LVL web (T), pop-out of the 1st LVL web from the top flange (P), and separation of the solid end block from the bottom flange (S). For all tests performed, the bending moment and shear force at failure were calculated using the first failure load. The first failure load was defined by a loss of load greater than 10% of the final maximum load. Three joists experienced residual capacity after an initial failure, namely 241-1-B, 241-3-B and 241-5-B as seen in Fig. (6) . The failure modes associated with these joists was predominantly due to tension failure perpendicular to the grain in joist 241-1-B and 241-3-B. Joist 241-5-B failed through pop-out of the 1st LVL web from the top flange followed by tension failure perpendicular to the grain causing ultimate failure of the joist. The mean flexural stiffness was found to be 0.3486 kN/ mm. This value is comparable to the theoretical flexural stiffness value of 0.4932 kN/mm for a solid OSB-webbed joist with no openings and having the same depth and flange dimensions calculated using a linear elastic model. The linear elastic model calculated the neutral axis and stiffness of the composite I-joist section using a series of transformed section analyses. The location of the neutral axis (yNA) is calculated using Eq. (2). where Ai is the transformed cross-sectional area of the ith component, and y̅i is the distance from the top surface to the centroid of the ith component. The second moment of area (I) is then calculated using the parallel axis theorem shown in Eq. (3). where Ii is the second moment of area of each component of the composite beam and yi is the distance from the neutral axis of the transformed section to the centroid of the ith component. The composite stiffness of the joist is then calculated by multiplying the second moment of area (I) by the modulus of elasticity of the top flange to which the other components were transformed. For the purpose of this model, the elastic modulus of the solid timber flanges and OSB web was assumed to be 12000 N/mm2 and 5000 N/mm2, respectively. It is worth noting that the interaction between the web and flange is considered to be fully composite and no partial interaction or slip in the joint was considered. This was assumed as no relative slip occurred between the web and flanges prior to reaching the point of failure. For beams that failed at this interface, failure was sudden and complete. Models examining partial interaction may be seen in Stojic and Cvetkovic [20D. Stojic, and R. Cvetkovic, "Analysis of a composite timber-concrete structures according to the limit states: Design and innovative methods in coupling of a timber and concrete", Facta Univ. Archit. Civ. Eng., vol. 2, pp. 169-184.] and Faella et al. [21C. Faella, E. Martinelli, and E. Nigro, "Steel-concrete composite beams in partial interaction: Closed-form ‘exact’ expression of the stiffness matrix and the vector of equivalent nodal forces", Eng. Struct., vol. 32, no. 9, pp. 2744-2754. [http://dx.doi.org/10.1016/j.engstruct.2010.04.044] ]. The mean peak load and characteristic peak load were found to be 7.24 kN and 5.19 kN, respectively for the 241 mm deep joists. This corresponds to a mean bending moment and shear force of 4.21 kNm and 3.57 kN, respectively. The characteristic bending moment and shear force calculated in accordance with EN 14358 [19CEN, EN 14358. Timber Structures - Calculation of characteristic 5-percentile values and acceptance criteria for a sample., Comité Européen de Normalisation: Brussels, Belgium, .] were 2.84 kNm and 2.41 kN, respectively. Bending test results for 241 mm deep latticed lvl web joists. Load-displacement curves for 241 mm deep joists in bending. Examples of each failure mode can be seen in Fig. (7) . Fig. (7a) shows tension perpendicular to the grain failure in the LVL web. This failure mode was observed in many beams manufactured with UF adhesive and was observed to be the cause of initial failures in joist 241-1-B and 241-3-B. Fig. (7b) and Fig. ( 7c) demonstrates pop-out failure of the LVL web from the top flange and the separation of the solid end block from the bottom flange, respectively. The latter failure modes commonly occurred one after the other with pop-out of the flange occurring first followed by separation of the solid end block. The bending test results have shown that the structural response of webs manufactured using UF and PRF adhesive was different with UF webs tending to fail in tension perpendicular to the grain. While LVL is not generally subject to tensile stresses perpendicular to the grain, utilising LVL in a horizontal lay-up of curved latticed elements makes it susceptible to this failure mode. The PRF web members were not as susceptible to failure perpendicular to the grain. The PRF joists generally failed due to a pop-out of the first LVL flange from the top flange followed by a separation of the end-block from the lower flange at one of the support points. The PRF joists performed better than the UF joists. The mean failure load, ultimate bending moment and shear force was greater for the PRF joists. One of the problems identified with the earlier tests was related to the height of the end-block which appeared to cause premature failure in one of the PRF joists. This was monitored closely during the subsequent manufacturing phase. For the 241mm PRF joists, the characteristic peak load, bending moment and shear force is 5.14 kN, 3.04 kNm and 2.57 kN, respectively. This is compared to a characteristic peak load, bending moment and shear force of 4.71 kN, 2.40 kNm and 2.03 kN for the 241 mm UF joists, respectively. Due to the superior performance of the PRF adhesive, all of the 305 mm deep joists were manufactured using this product. The bending tests results are tabulated in Table 2 and presented graphically in Fig. (8) . All joists failed through pop-out of the first LVL web from the top flange and then separation of the solid end block from the bottom flange, with the exception of joist 305-1-B, which failed through tension perpendicular to the grain in the LVL web. The mean peak failure load was 9.34 kN and the corresponding bending moment and shear force are 8.47 kNm and 4.67 kN, respectively. The characteristic peak load calculated on the basis of the eight bending test results is 7.33 kN. This corresponds to a characteristic bending moment and shear force of 6.66 kNm and 3.67 kN, respectively. To assess the performance of the latticed LVL webbed I-joists, the experimental characteristic bending moment capacity is compared to that of commercially available I-joists in Table 3. Commercial I-joists with overall depths of 241 mm and 305 mm, having solid timber flanges and solid OSB webs, are considered [22B. Cascade, ALLJoist Specifier Guide. Available at www.bc.com, Accessed 19/09/18]. For both joist depths, the flange section is 63.5 mm wide and 38.1 mm deep. The bending moment capacities of the commercial joists are reported in terms of the Allowable State Design (ASD) moment [22B. Cascade, ALLJoist Specifier Guide. Available at www.bc.com, Accessed 19/09/18]. The short-term bending moment capacity of these joists may be determined by multiplying the ASD moment by a factor of 1.5. The short-term moment is considered to be more appropriate for comparison with the experimental test results. For the 241 mm deep commercial joist, the ASD and short-term design moment are 4.60 kNm and 6.90 kNm, respectively. The characteristic bending moment determined from experimental tests is 61.7% of the ASD moment and 41.4% of the short-term design moment of the commercial I-joist. The characteristic bending moment capacity of the 305 mm deep latticed joists compared better with commercial I-joists than was the case with the 241 mm joist achieving 112% and 74% of the ASD and short-term moments, respectively. Failure Modes: a) tension perpendicular to the grain, b) pop-out of the LVL web from flange, c) separation of solid end block. Load-displacement curves for 305 mm deep joists in bending. Bending test results for 305 mm deep latticed lvl web joists. Comparison between the experimental characteristic moment capacity and that of the commercial joist product [22B. Cascade, ALLJoist Specifier Guide. Available at www.bc.com, Accessed 19/09/18]. 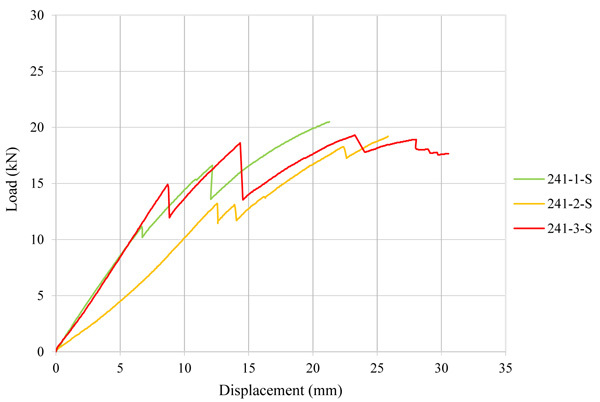 Comparison between the flange geometry and stiffness of the experimental and commercial joists [22B. Cascade, ALLJoist Specifier Guide. Available at www.bc.com, Accessed 19/09/18]. Irrespective of the large openings in the latticed LVL web, the deeper joists had high bending moment capacities relative to the solid OSB webbed I-joists. It is considered that the relatively poorer performance of the 241 mm series joists was due to the different adhesives used in their manufacture. As demonstrated during experimental tests, joists made with UF adhesive were susceptible to tension failure perpendicular to the grain, which has contributed to reduced capacity. To reduce premature failure of the web, it is recommended to use PRF adhesive in future tests. The deeper 305 mm joists, manufactured with PRF adhesive, performed significantly better than the 241 mm deep joists relative to their solid web counterpart. The joist stiffnesses are also compared in Table 4. For a joist depth of 241 mm, the stiffness of the experimental I-joist achieved 77.4% of the commercial I-joists. When comparing the 305 mm I-joists, the experimental I-joist demonstrated a greater stiffness than the commercial I-joist notwithstanding the large openings in the web of the experimental joists. It is likely that this is mainly due to the larger flange area of the experimental I-joists. 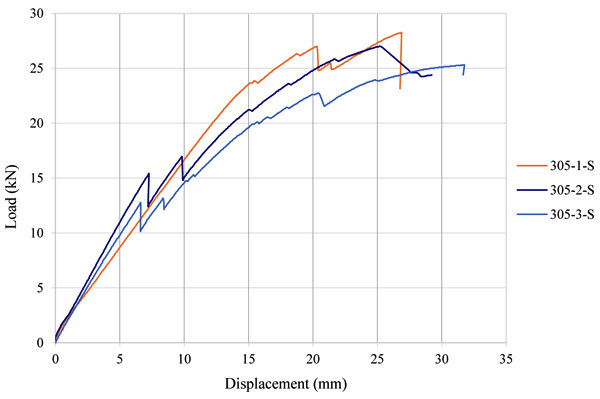 The results of the shear tests performed on 241 mm and 305 mm joists are summarised in Tables 5 and 6, respectively. The load-displacement curves for the 241 mm and 305 mm deep joists can be seen in Figs. (9 and 10 ), respectively. In all tests, the response was linear elastic up to a first failure load. The load continued to increase after this point with large increases in deflection prior to the ultimate failure of the test specimen. All joists experienced web failure with a pop-out failure of the first latticed LVL web from the flange followed by separation of the solid end block. The shear capacity of each joist was taken as the shear force at the first failure load. The mean first failure load was found to be 14.90 kN and 17.28 kN, for the 241 mm and 305 mm joists, respectively. This corresponds to a mean shear load of 7.45 kN and 8.64 kN, for the 241 mm and 305 mm joists, respectively. Shear test results for 241 mm deep latticed lvl web joists. Load-displacement curve for 241 mm deep joists in shear. Shear test results for the 305 mm deep latticed lVL web joists. Load-displacement curve for 305 mm deep joists in shear. where D is the hole depth and W is the hole width. Utilising Eq. (4) and (5) to account for a circular hole of diameter 50 mm and a square hole 60 mm wide and 50 mm deep, the shear capacity of the 305 mm deep joist is reduced to 6.28 kN for the circular opening and 5.73 kN for the square opening. Compared to the experimental results, the latticed LVL web joist achieved similar shear loads with much larger openings in the web. The shear capacity demonstrated experimentally on the 305 mm latticed LVL web joists achieved 72.9% and 79.9% of the commercially available joist with one circular and square opening, respectively. The short-term failure behaviour of latticed LVL web I-joists has been investigated experimentally. The moment carrying capacity and shear force have been determined from the results of the testing programme, which comprised a total of 30 joists of two different depths. 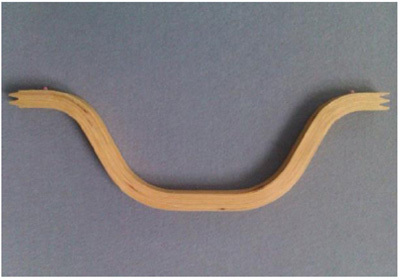 For bending tests, the load-deflection response was found to be linear elastic to failure in 21 of the 24 joists tested in bending. For the remaining 3 joists, the load-deflection response was found to be linear to an initial failure load followed by a further increase in deflection before ultimate failure occurred. The load-deflection response behaved non-linearly after the initial failure load reaching a peak load between 102% and 122% of the initial failure load. For shear tests, all tests specimens experienced a linear load-deflection response to an initial failure load followed by a further increase in deflection before ultimate failure occurred. The following conclusions can be formulated based on the experimental test programme of 241mm and 305 mm deep latticed LVL I-joists. Failure occurs in the web, with the exception of joists containing a significant defect in the tension flange of the web. Latticed LVL web members manufactured from UF adhesive are more susceptible to failure tension perpendicular to the grain than LVL web members manufactured from PRF adhesive. Such failure in the web resulted in an initial loss of load, with more ductile behaviour prior to the ultimate failure load. Joists manufactured using PRF adhesive were subject to more brittle failure behaviour. Joists manufactured using PRF adhesive outperform joist manufactured from UF adhesive in terms of peak load, bending moment capacity and shear capacity and should be considered in future experimental test programmes. The latticed LVL web I-joists compared favourably with similar sized I-joists with solid webs with regard to moment and shear capacity and have been shown to be a suitable alternative to commercially available I-joists that can also facilitate openings for services without adversely affecting the structural integrity of the joist. Further testing is required to establish the long-term performance of these joists. Lattice LVL web joists are highly indeterminate structures, which are not susceptible to simple methods of analysis. For this reason, and as testing is time consuming, expensive and the range of geometrical parameters is large, a numerical modelling approach is recommended to optimise the geometry of the joist to maximise performance. This work has been carried out as part of the project entitled “Innovative I-Joist Products” (Project Code IP-2007-0453) funded by Enterprise Ireland and Grainger Sawmills under the Innovation Partnership program. The contribution of the technical staff of the College of Engineering and Informatics, NUI Galway, in particular, Peter Fahy, Colm Walsh and Gerard Hynes, is acknowledged. The authors would also like to acknowledge the contribution of project partners, Sean Moloney and Michael Bourke at the Wood Technology Centre, University of Limerick. R.J. Leichti, R.H. Falk, and T. Laufenberg, "Prefabricated Wood Composite I-Beams: A Literature Review", Wood Fiber Sci., vol. 22, no. 1, pp. 62-79. M.T. Afzal, S. Lai, Y.H. Chui, and G. Pirzada, "Experimental evaluation of wood I-joists with web holes", For. Prod. J., vol. 56, no. 10, pp. 26-30. G. Baylor, and A.M. Harte, Finite element modelling of castellated timber I-joists., vol. 47, Constr. Build. Mater, . "ETA 06/0238, STEICOjoist and STEICOwall, no. August", EOTA-European Organisation of Technical Approvals, pp. 1-18. "ETA-09/0283, Boise BCI Joist", EOTA-European Organisation of Technical Approvals, . "ETA-07/0161, POSI-JOIST, Metal Web Joist for Structural Purposes", EOTA-European Organisation of Technical Approvals, . "ETA-07/0032, EASI-JOIST, Open Web Beams", EOTA-European Organisation of Technical Approvals, . CEN, EN 14358. Timber Structures - Calculation of characteristic 5-percentile values and acceptance criteria for a sample., Comité Européen de Normalisation: Brussels, Belgium, . D. Stojic, and R. Cvetkovic, "Analysis of a composite timber-concrete structures according to the limit states: Design and innovative methods in coupling of a timber and concrete", Facta Univ. Archit. Civ. Eng., vol. 2, pp. 169-184.